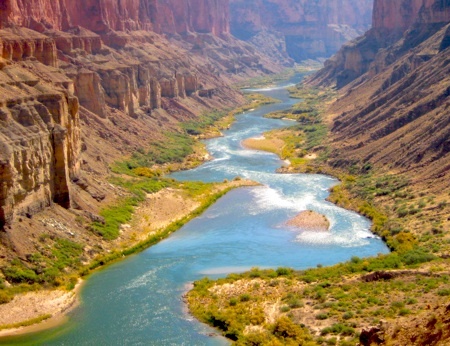 The Nankoweap is one of the fabulous Rim-River trails; these routes all start from either the South or the North Rim of the Grand Canyon, run down thru a billion years of geologic time to the Colorado River (really fun), and then climb back out again (sometimes less fun). 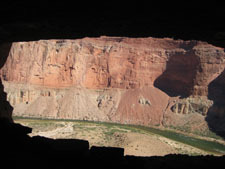 In early season one moves carefully over snow and ice on top, which very quickly change to green trees and grass at the bottom; these trails start in Ponderosa and sometimes Aspen forests, rocket down thousands of vertical feet thru a spectacular desert landscape, finally arriving at the biggest and grandest river in the Southwest. According to the NPS, the Nankoweap is the hardest trail in the entire Park, and has the biggest vert: 6,000′. It is barely maintained, is remote, and not popular. What’s there not to like? 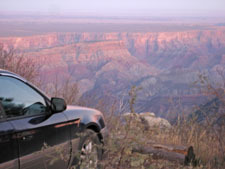 October 23, 6:50 AM – After a 23 degree night on the North Rim – fortunately spent in the back of my car instead of the open air – I start at daybreak. Aspens and Firs give way Oak Brush and Ponderosa’s as I leave 8,800′ elevation and go down, down, down. Massive views are immediate. The trail contours for miles on a ledge in the Supai, with cliffs above and below, before making another big drop thru the Redwall. 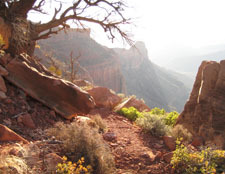 It mostly can be followed w/o difficulty, but this is no Kaibab or Bright Angel Trail … it’s a path thru the cliffs, made by footsteps of hikers, over around and thru the brush, rocks, and cactus. The combination of tricky footing, up/down gradient, and jaw-dropping vista’s means this will take a lot of time. Good. Sometimes I like going for a quick time, sometimes not. 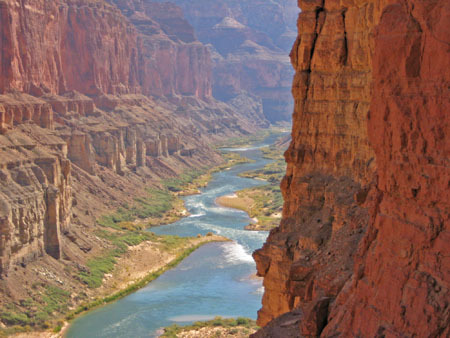 The Grand Canyon takes my breath away, so it makes it hard to run! The trail finally spits me out into Nankoweap Creek, which has a good perennial flow, cottonwoods changing color, and an excellent site with some campers spending 5 days down there; the only people I’ll see on the entire day. I fill up with precious water, and continue 3 miles on user paths to the River. Seeing the Colorado is a marvel. A huge river, lusty, clear, and bright blue, surrounded by dry and hard rock walls thousands of feet high and 200 miles long. If I went here every year for the rest of my life, I would be shocked and delighted each time. The days are short and the nights cold, so time to get a move on and get back up. This is normally a 3-day minimum backpacking trip, but I’ve done these things enough to be able to guess time accurately. I left at first light and moving fairly slowly, I’ll be back up exactly at last light. And that’s just what happened. The slog back out was actually very nice, as I didn’t work the pace, but instead enjoyed the view, the location, and the softening evening light, gradually shifting from glowing red, to amber, to soft muted hues, with the desert beyond the South Rim holding the last of the glowing colors, like the embers of an old campfire. This entry was posted on October 24, 2008 at 11:11 am and is filed under Trip Report. You can follow any responses to this entry through the RSS 2.0 feed. You can leave a response, or trackback from your own site. Wow, that last pic is beautiful! What great timing, Buzz. I’ll be making my first trip to the Grand Canyon very soon and now I have a great out of the way trail to hit. It looks gorgeous. Magical shot… it almost looks like a painting! I’ve done RtoR South to North hike & North to South run but sounds like I need to adventure to this “remote” site. We go in May & want to try the October time frame. After one has ticked the standard R2R2R (South Kaibab to River, up North Kaibab to Rim, back again), I think 2nd on the list would be the Boucher – Hermit Loop. 3rd would be the unbelievable Thunder River, coming down the Bill Hall Trail from the N Rim. Nankoweap after those … this is a great route, but best for people who’ve already “been there, done that” in other parts of the Canyon. Buzz – you should definitely do the Bill Hall Trail. Its my pipe dream to do that, spend one day onthe Thunder side, then go over to the Deer Creek side, hitch a ride across the river, spend the night at Poncho where there is killer bouldering and climbing then head out the next day. Defintiely not as fast, but still crazy fun to hang out on the Patio in Deer Creek. Thanks for the thought. Yes, I did Bill Hall years ago. Last May did something much better: down off Indian Hollow to Thunder River and Deer Creek, bushwhack along the River to Kanab Creek, then up that to close the loop. Outstanding; 100 miles, 3 days.